Beatriz da Costa's Pigeon Blog was used to establish the Festival's public image. The Etoy Mission Eternity team arrives in San Jose. Photo by John Roloff. The cavernous South Hall, Photo by John Roloff. The ISEA/ZeroOne festival took over downtown San Jose in early August and lived up to expectations on many levels. Though rumors of organizational uncertainties circulated up to the start of the festival, the entire event ran smoothly and without visible hitches thanks to staff dedication and a number of smart planning decisions. Parallel conference sessions were just across a hall from one another to permit easy panel-hopping. A sponsor provided hundreds of really comfy chairs for the sessions, rendering a modicum of relaxation even as discussions sometimes went into inscrutable overdrive. Best of all, most events were within an easy walking distance and navigation of the festival was a breeze. With locative media and data-mapping among the principle themes of the event, a plethora of projects that rendered one space onto another were presented with widely varying results. Some of this variation depended on the appeal of the mapping concept itself, though a winning initial concept was not always a help in the realization of the project. Beatriz da Costa’s PigeonBlog used homing pigeons to sample the air pollution over San Jose and send the results online in realtime. The piece got lots of attention (including animal-rights groups) and served as pointer towards innovative ways of thinking about the use of mobile technology where the innovation is on conceptual rather than technical levels. Here even occasional technical problems didn’t detract from the sense of overall success of the piece. In a similarly smart juxtaposition, Etoy’s Mission Eternity,shown in a container in front of the San Jose Museum, was a system to prepare personal data for the eventuality of its owner’s death; mapping the afterlife here seemed very appealing. Closer to the present ground Skatesonic by Cobi van Tonder harnessed position sensors to custom skateboards and used the data to generate a soundtrack for skaters in a half-pipe. The mapping of motion to sound was much clearer in rehearsals than in the actual performance, which despite all the movements of riders on boards didn’t actually have much forward momentum. In addition the positioning of the sensor units on the undersides of the boards prevented the skaters from doing many of usual their moves, and the event seemed hampered on both technical and performative levels. Karaoke Ice, an ice cream truck and karaoke unit in one, drew a large audience wherever it was parked and provided multiple pleasures while maintaining a healthy sense of humor. The sweet treats and audience performances were obvious wins, but who’d have thought that “Blister in the Sun” would sound so good when rearranged for the ice cream bells? Bill Viola’s keynote talk was hyped as a high point of the festival, though in the context of ISEA, it seemed somewhat anachronistic. While the working methods and artistic precepts he described work well for him, they certainly don’t have the universality that he implied. He expressed concern about the overload of available cultural stimulus today and said it was necessary for an artist to be open to influence but at some point to “draw into oneself” to develop a meaningful artistic process. It’s doubtful that members of Etoy, the artists behind Karaoke Ice, or anyone whose work involved a social sculpture paradigm (and there were many in the festival) would agree. 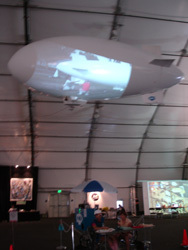 Many of the pieces were located in the San Jose Convention Center’s South Hall annex, a cavernous tent structure located on a former parking lot. The pieces on view there all had the familiar quality at events like these of being done in by the space. Looking more like a trade show than art exhibit, the assortment of tables and podiums, computer equipment, and flat-panel screens that made up the work were dwarfed by the space and its uniformly indifferent feel. As a result, the pieces that came across best were the ones which had a presentation format that could assert itself against the space, regardless of the content. There were many pieces that would have benefited from a different exhibition format and subsequently required more active engagement from the viewer here to engage with them. Many positive reports came from the “Container Culture” exhibit at the back of the South Hall. Organized as curatorial part of ISEA’s Pacific Rim New Media Summit and housed in containers that defined a concrete space for the pieces, the show held its own on formal terms and kept visitors in the area for longer than anywhere else in the Hall. Among the notable works here was IN[ ]EX, a piece by a Vancouver collective that used the distribution of wired wooden blocks to map local activity back into a percussive sound installation inside the container. Elsewhere Natalie Robertson’s Uncle Tasman looked at industrially-induced environmental degradation to significant Maori sites. Played on a trio of small monitors rather than the intended projection format, the piece nonetheless stood up against its reductive presentation and offered something scarcely found elsewhere in the festival: a seductive and multi-layered narrative that didn’t require a viewer to navigate some scheme of interactivity to access. In a similar vein, Colin Ives’ Nocturne featured infrared video of wild animals that have adapted to urban and suburban environments. Here, inside a space surrounded by a chain link fence, viewers passively triggered footage that reminds us of the casual and uneasy symbiosis found in spaces that conflate the natural with the urban. Overall, though, there was more than enough satisfactory food for the eye, ear, and brain on offer at the festival. It is a credit to Steve Dietz and his team that they pulled this off so well in what seemed like an unlikely venue. As Christian Frock mentioned to me, this was the kind of event that the Bay Area has needed for a long time and the surprise was that it was San Jose where it happened. — Stretcher crew member Ed Osborn is a sound artist and member of the faculty at the University of California, Santa Cruz.